I really wanted a website to sell my products online. The problem was that I wanted to try all the features the site builder had before I spent one dollar. A friend of mine had just built her own website using Easysite and said I could try before I buy! This was exactly what I was looking for. I signed up and tried all the features and found it was just what I was looking for. I can't beleave you can even build an online store and the price remains the same. Its great! I could not beleave how easy it was to build a website. I have no web coding knowledge, I had a facebook business page which was limited and decided to do a search on the web for a site builder that I could use to build a website myself. After looking at a few site builders I choose Easysite.com and can honestly say that I found the system tops. Even the online support is great I spoke to someone called Matt and he helped me. They even gave me a free domain name. Thanks Guys. My wife and I run a very busy bakery and don't have the time to build a website, but wanted to be able to update our site when new products came out. After speaking to the guys at Easysite we decided to let them build our site for us. Within about 2 weeks they had created our site from the photos and content we gave them and it looked good. They also called us and explaned how we can edit and update our site ourselves. If you in business and want a website let the team at Easysite create your site for you thats my advice! Thanks Steve your support team are great. The thing I like about building a website using Easysite is that its so easy to use. Unlike other website builders there is nothing to download, install or activate. Its made for people that have never made a website in there lifes before. If you can write, have a computer and internet then you can make a website in the comfort of your home or office using Easysite its that easy. I buy second hand lots of materials and advertise them on my site. I even have payment buttons for visitors to pay online. The store page is great thats where I sell my material. To think I pay less than $20 each month and that includes a store on my website - Easysite you the best. 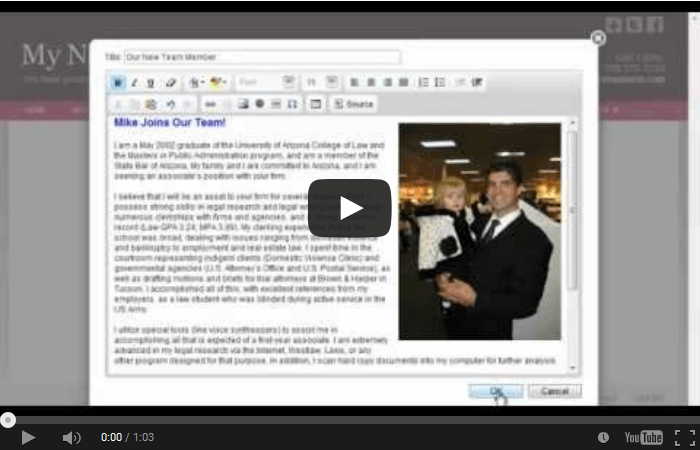 Below are video testimonials from people just like you that have built a website with Easysite. Click on the below video testimonal to see what they say. Clark Bartram is in the fitness industry and one of the most important things is to have a great looking website that is easy to add content, images and update yourself. Sam Feliccia wanted a website for his business. He wanted to tell the local neighborhood about his restaurant business and decided it was time to learn how to make a website. Terence Cooper makes great music. What Terence can't do is make a website, that is until he found Easysite. Thats right, with no idea how to build a website he not only choose the look of his site but added images and content all by himself. Karyn Imel loves Easysite because its easy to use. Having never designed her own site before, she found Easyite.com to be great. No need to pay the web guy when you add content and images yourself. You can save those extra dollars for other things in your business. There is a reason its called Easysite. We have made building a website easy, in fact its so easy to create a website that even your Granny could do it. Start today! Start creating your website for free. Try all our fantistic features our site builder has to offer free for 30 days. No payment required. We want you to try before you buy. After you have tried Easysite.com we offer a free domain when you sign up. This free domain is yours to keep, even if you leave us we will transfer your domain to a domain registrar of your choice for free. Our site builder has all the latest software built in. This means your site will look professional and be responsive and look great on any device its viewed on. You get fast reliable hosting with every site. It does not matter how many visitors or pages you have on your site our hosting won't let you down. Open your own online store and sell stuff online. Easysite includes eCommerce software on our site builder and it does not cost you any extra. Build a website or build an online store website its up to you. We love helping people to get online and create their own website, thats why Easysite was created. Our site builder helps the man in the street so to speak build a website. No coding knowledge required. If you require any help please feel free to contact us. Welcome to our video tutorials on how to set-up and build your very own website. My name is Steve Sivulka and I am the owner of - The video tutorials on this page will help you have a better understanding of how to set up your site. Please watch them and if you require any addional help feel free to email me steve@easysite.com. VIDEO 1 - Every website created using Easysite.com starts out with a 30 day free trial. No credit card or payment information is required, and there is no obligation to purchase your site after the free trial. We are so confident that you will use Easysite to create your website we want you to try it out now. Watch video 1 above to see how the sign up process works, what the site builder looks like and how to start building your own website. VIDEO 2 - This video tutorials will guide you on how to change the look of your site. When you are in the site admin part of the site builder you will be able to select a theme of your choice and change the look of your site in seconds. 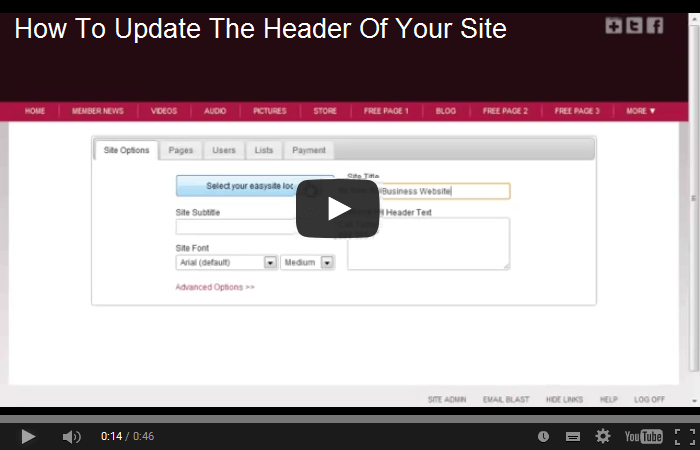 VIDEO 3 - In this video you will learn how to change the header on your site. This is where you write the name of your website, follow the video tutorial to learn more. VIDEO 4 - One of the first things you will want to do when you create your own website is to organise the pages and menu. This video tutorial will show you the best way to do that. VIDEO 5 - When you build a website you will have to upload images or post pictures on a page. The above video tutorial will show you how easy it is to post pictures on your site. VIDEO 6 - Here is a easy to follow video tutorial on how to post videos on your website. Its so easy and quick you will love using Easysite. VIDEO 7 - The video above shows you how to add news to your site using the editor. Remember search engines like a page to have at least 500 words, more is better and write for the people reading the article not the search engines. The editor has all the features you need to make your page look and feel great. 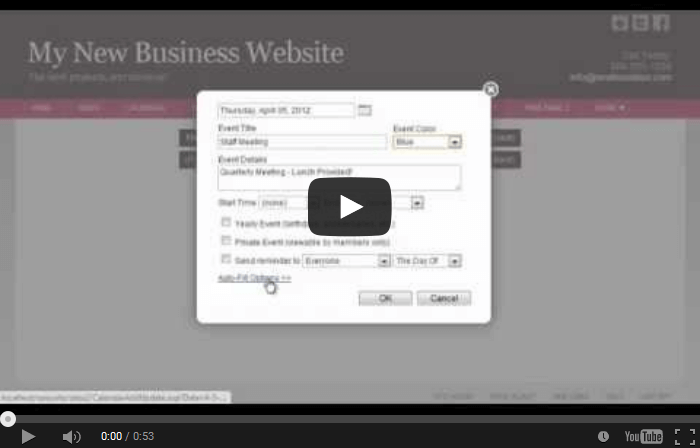 VIDEO 8 - Its easy to let your visitors know what to expect in the months ahead. Easysite already has your calander set up all you have to do is add the event, no installing plugins. Watch the video above and you will see why its called Easysite. 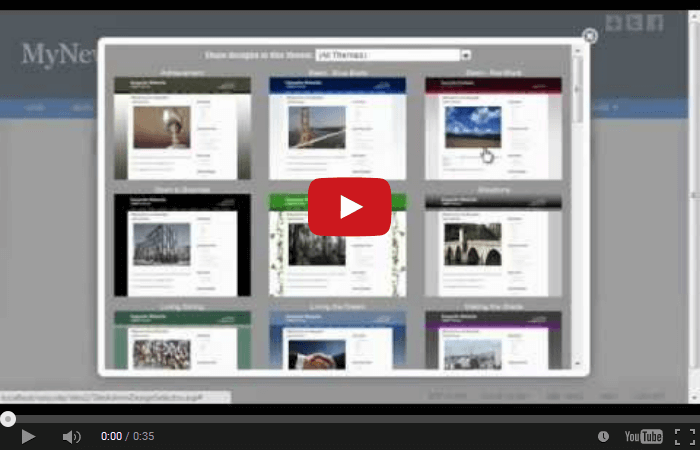 VIDEO 9 - The custom page is probably the most useful and flexable pages on your site. Think of the custom page as a blank piece of paper, that you can use to layout pictures, text videos any where you want on your page. Watch the video tutorial above and see how easy it is use your custom page. 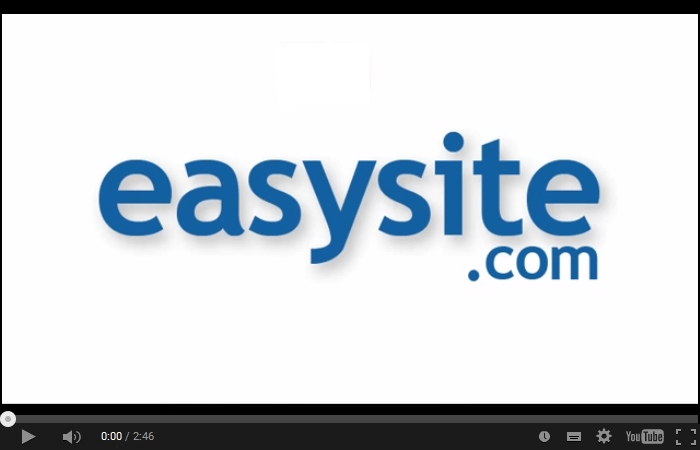 VIDEO 10 - Every easysite website has a store page included. That's right you don't have to upgrade or spend any more to sell products on your own online store from Easysite. See how easy you can start selling stuff on your own store page. 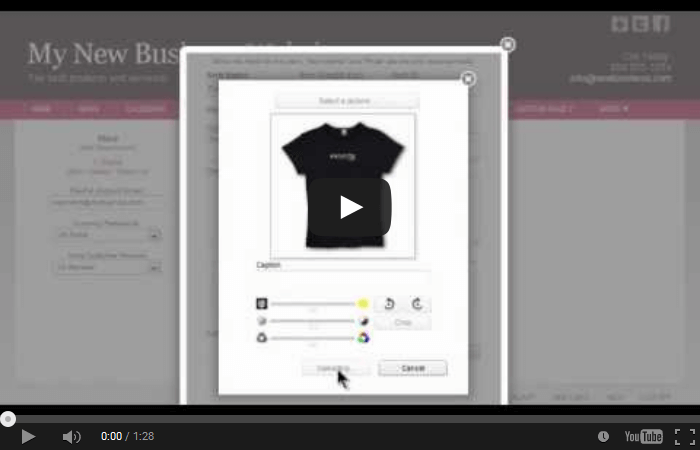 Learn more on how to set up your store page by watching the above video tutorial. Easysite customers are surprisingly shocked at how professional looking our business website templates are and how easily you can change your website look at any moment. If you would like to start building your website or have Easysite build your website for you then sign up today!